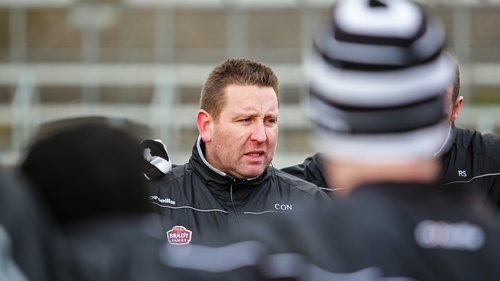 Kildare manager Cian O'Neill admitted his team were devastated by the manner of their latest League defeat and claimed his side were on the wrong end of a few "shocking" refereeing decisions. A spectacular Mattie Donnelly point in the sixth minute of injury-time gave Tyrone a one-point victory in Newbridge. It was Kildare's second successive one-point loss to Ulster opposition and they have yet to get off the mark in the top tier. O'Neill credited his team with delivering a much improved performance on their display against Monaghan but crucial refereeing decisions left a bad taste. It was referee Paddy Neilan's application - or non-application in the estimation of the Kildare boss - of the advantage rule which infuriated O'Neill. "It's devastating for the players. It was a real titanic battle between two teams that needed points. Listen, I'm very happy and proud of the lads with their performances. There was nothing between the two teams. Once again, a goal just before half-time cost us. "But need a little bit of luck but some shocking decisions went against us, particularly with the advantage plays. If that happens once, it's disappointing. If it happens three times, it's embarrassing really. "I don't want this to become a discussion about the referee but they were critical parts of the game. There's an advantage rule there for a reason. "As I said, if it happens once, that's just an error. When it happens repeatedly, when we're in scoring positions and the play is pulled back, it's just not on. "These guys train way too hard and way too often for these things to happen. It's devastating really for the boys. They put in a big shift there. They were playing a very experienced and seasoned team there in Tyrone. It was always that type of match when it would be really fine margins that decided it and unfortunately we came out the wrong side of it. "They battled to the very end and we had chances. We didn't convert as well as would have liked but it was a huge improvement on last weekend and we're definitely moving in the right direction."